This may be my favorite room ever! 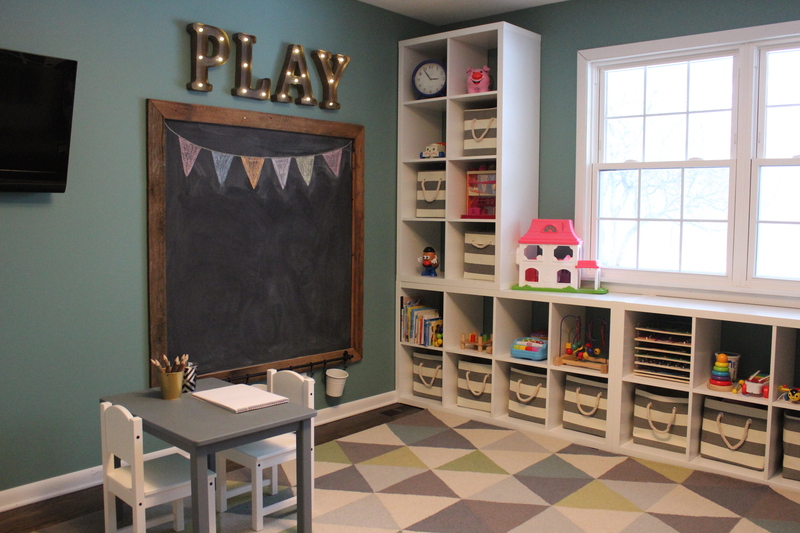 I’m so excited to share the finished photos of our new playroom. 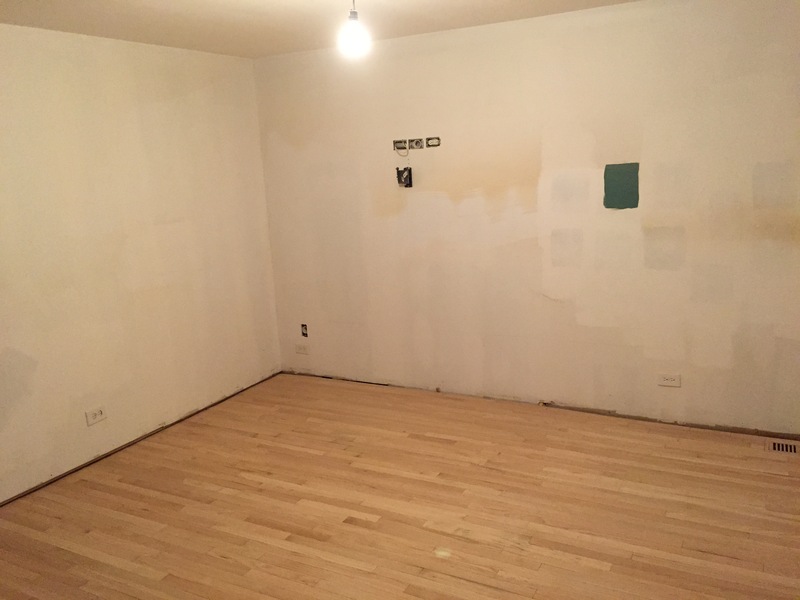 As a reminder, here is what the room started as, it was a weird den/office that we hardly used. 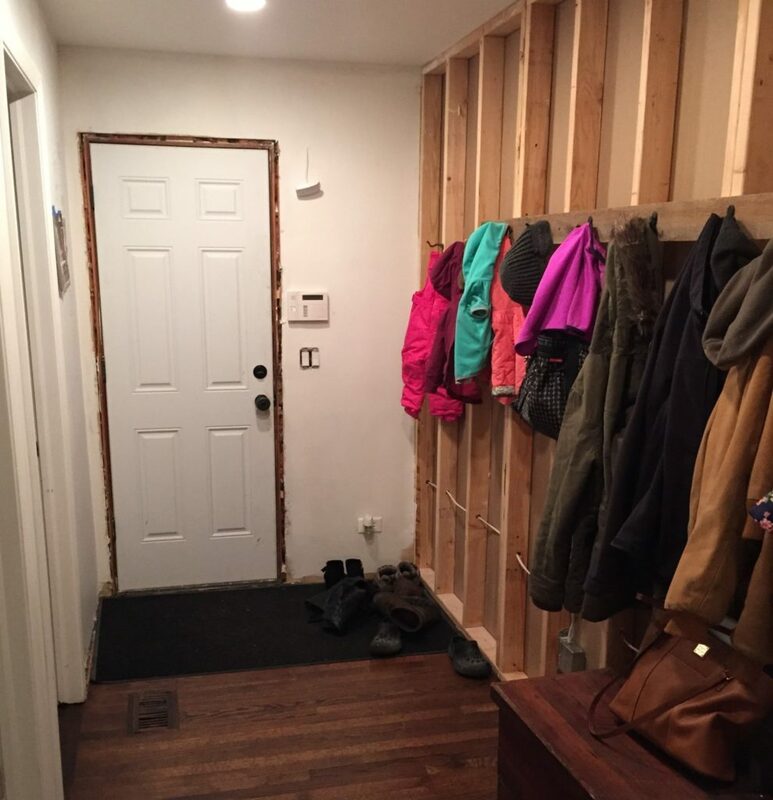 After we built a wall dividing the space into a seperate playroom and mudroom, removed the fireplace, patched and re-stained the hardwood floors, added/moved some electrical, removed the wall paneling and finished the drywall, the room was looking like this. Today, it looks like this. 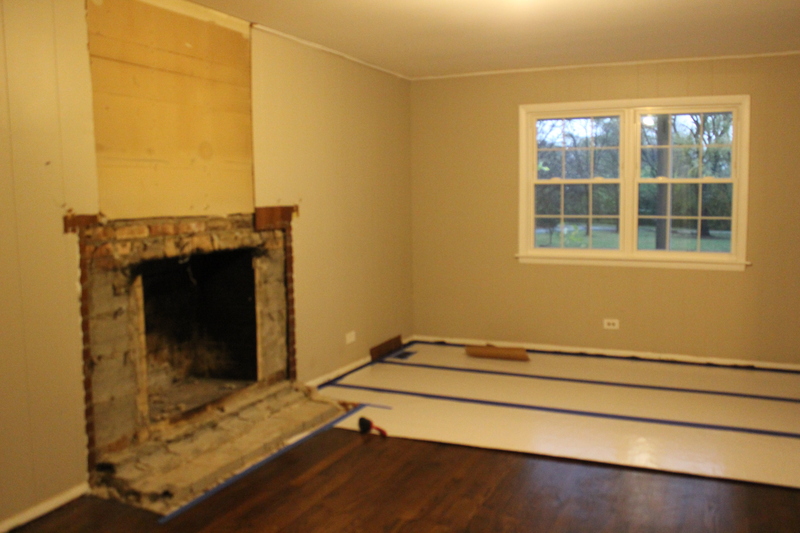 We painted the walls a dark teal from Benjamin Moore called Shenandoah. It is such a fun color, I love it! 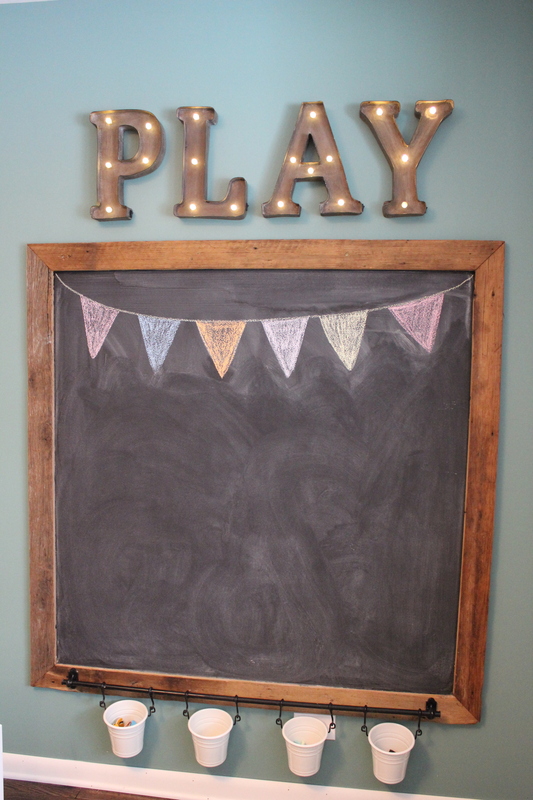 We built the chalkboard using reclaimed barn wood that we had leftover from our living room beams. We just framed a sheet of plywood painted with magnetic and chalkboard paint with the barnwood. 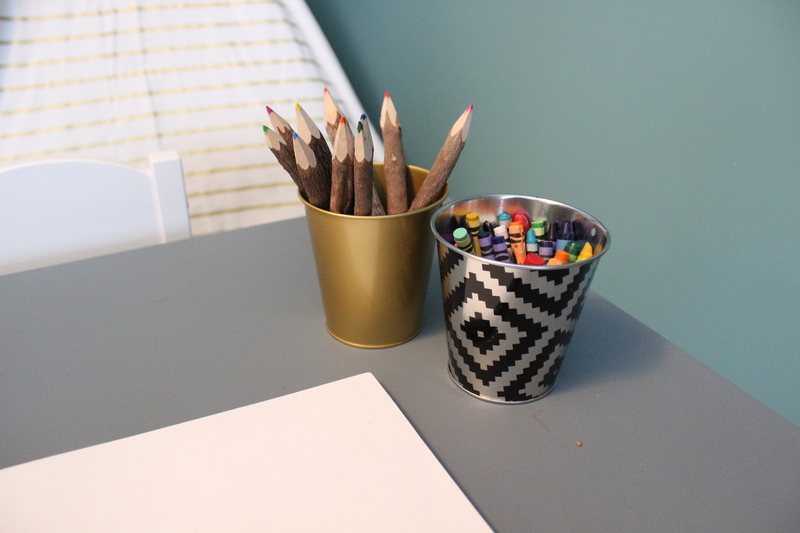 The buckets at the bottom hold chalk, an eraser, and magnetic letters. It is the Fintorp system from Ikea. 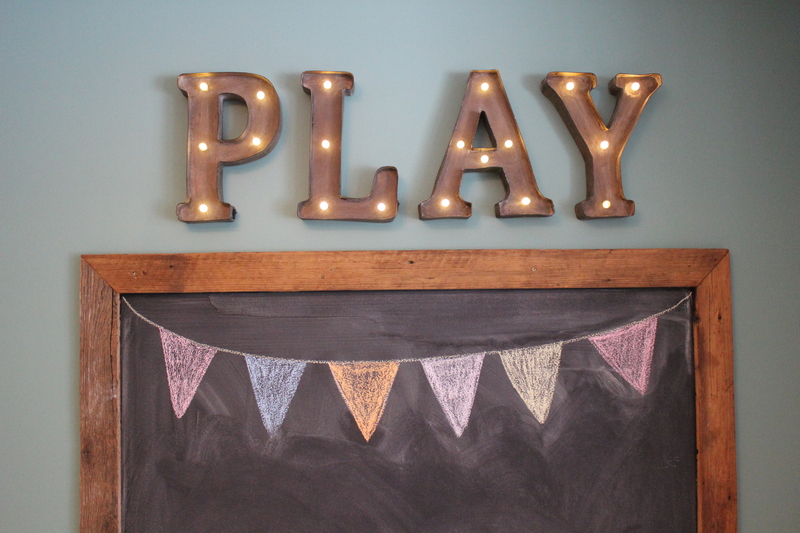 Above the chalkboard are these marquee letters from Pier 1. 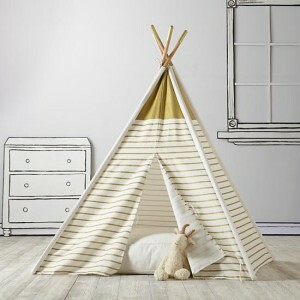 The gold and white striped teepee was Kate’s big present from Santa. “He” got it from Land of Nod. And then we hung these ledges from Target next to it for easy access to books. The rug was my inspiration for the room. It is this one from Rugs USA, which I got 80% during a Black Friday sale. I love that is fun and playful, but not too kiddy. 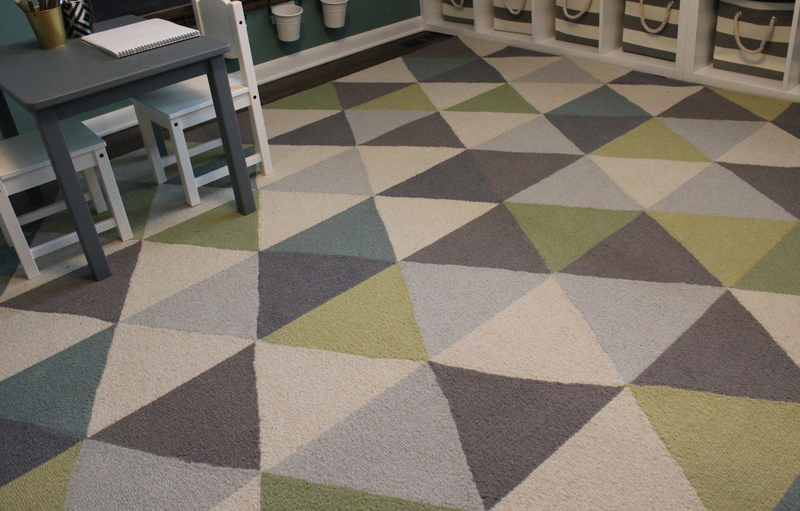 It is a great quality rug for the price. 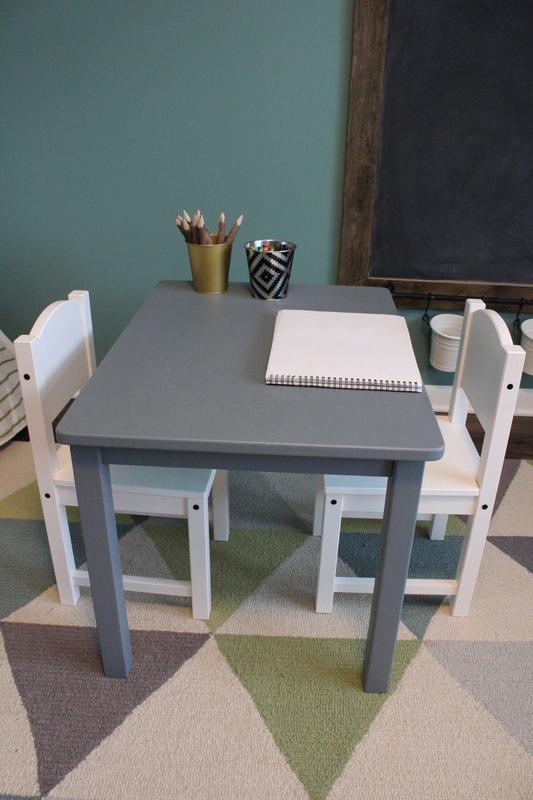 The table was a hand-me-down Winnie the Pooh table that I painted Peak Point by Behr. The chairs are the Sundvik chairs from Ikea. I love these little buckets to hold art supplies that I found in the Target Dollar Spot. 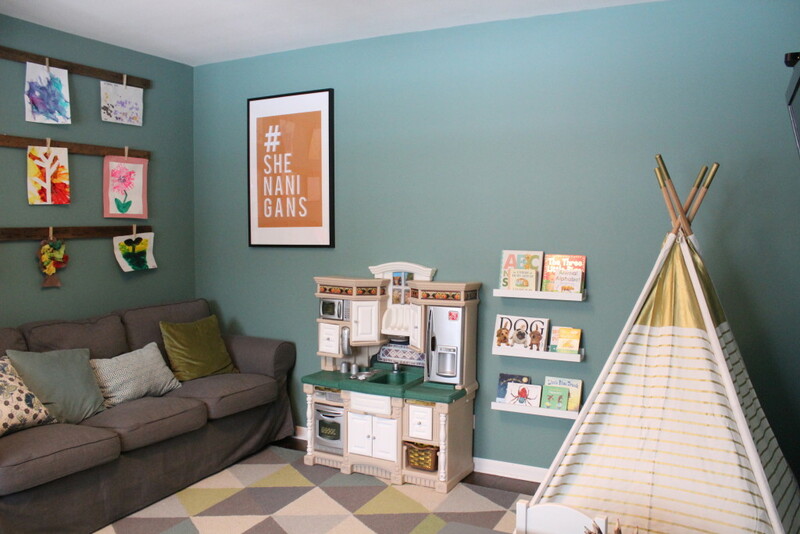 On the other side of the room is Kate’s play kitchen (a hand-me down), a comfy couch, and Kate’s art projects. I got these green and blue throw pillows and blanket from World Market. 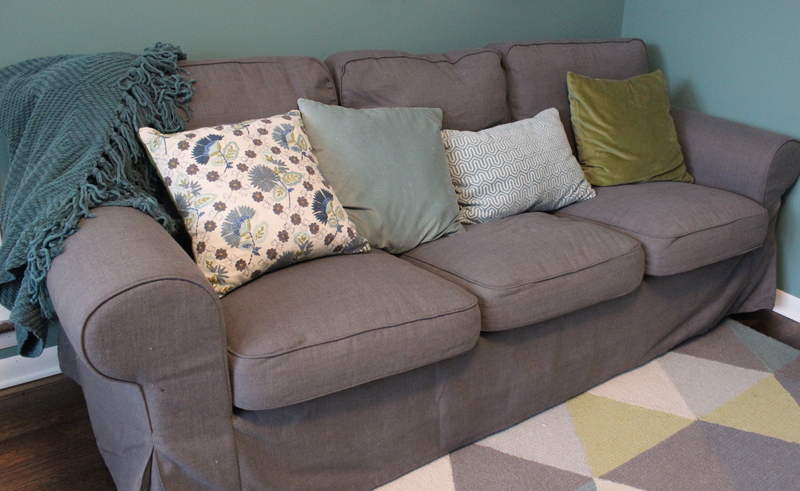 The couch is the Ektorp from Ikea. 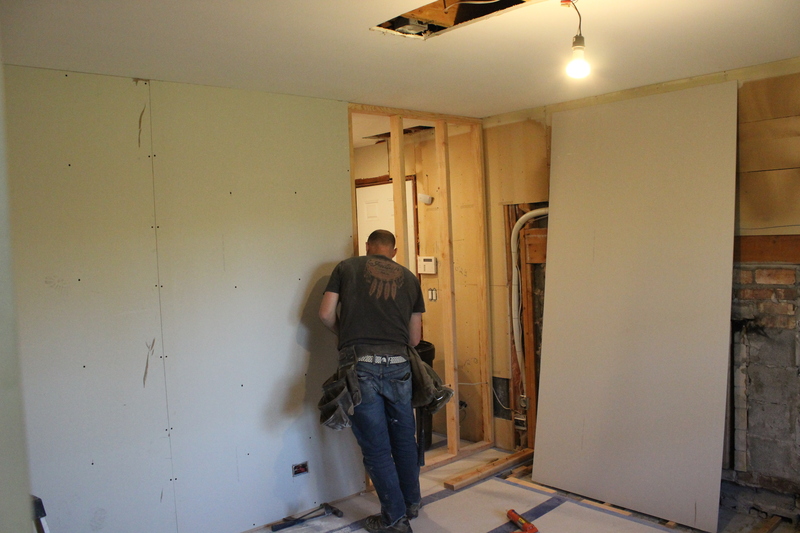 It used to live upstairs in a spare bedroom, so we were happy it fit well in this space. 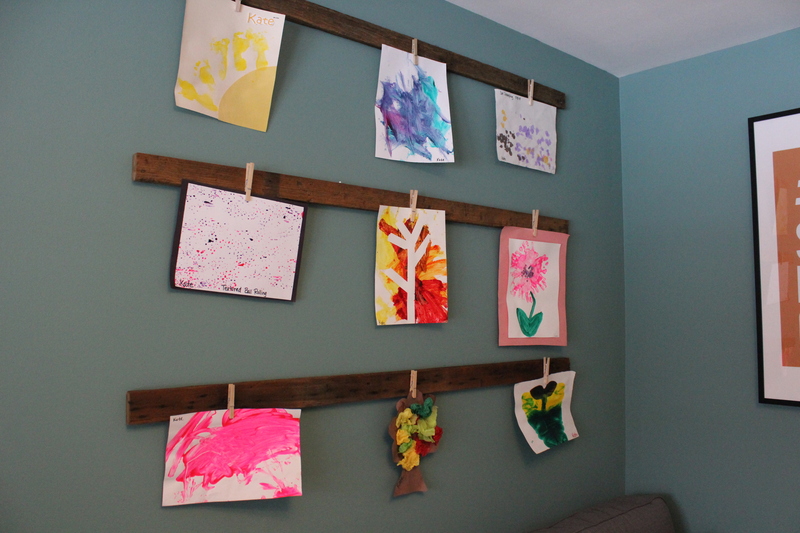 The art holders are made from more of the leftover reclaimed barn wood. I stuck pushpins through clothespins and pushed them into the wood to hold the art. This way I’ll be able to move them around as needed. I’m still contemplating spray painting the clothespins. 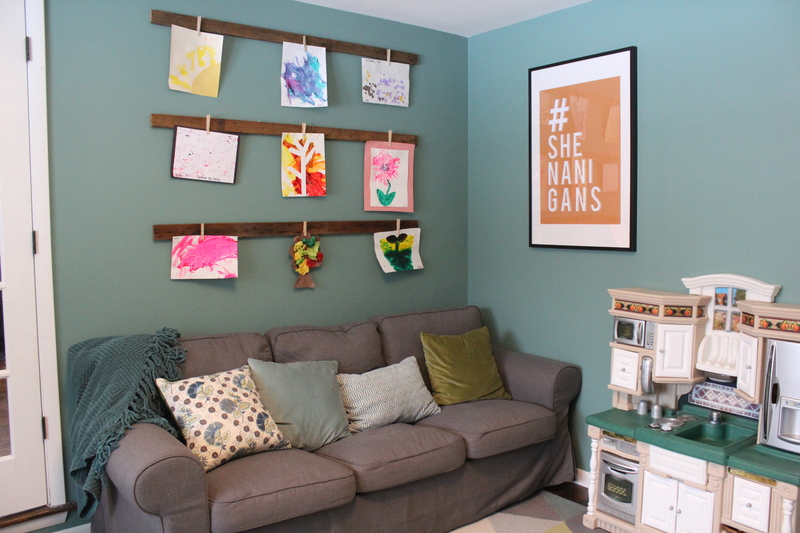 The wall art is a free printable I found here (it’s available in four colors). 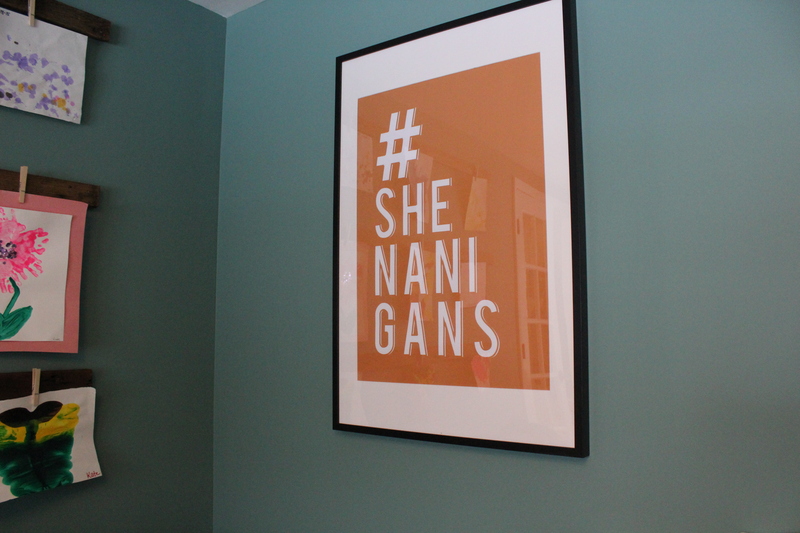 Then I just printed it at Office Max and framed it with an Ikea frame. 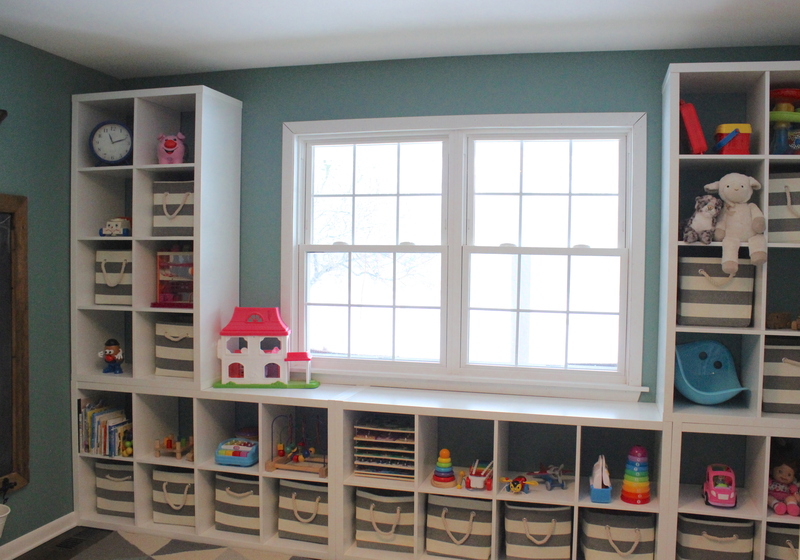 On the last wall is a big wall of cubbies to hold all of Kate’s toys. How do they accumulate so much? 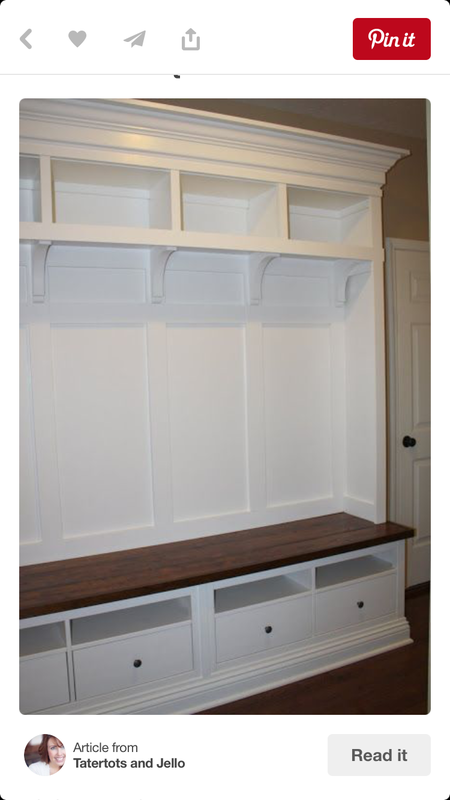 These are Ikea’s Kallax shelving unit. 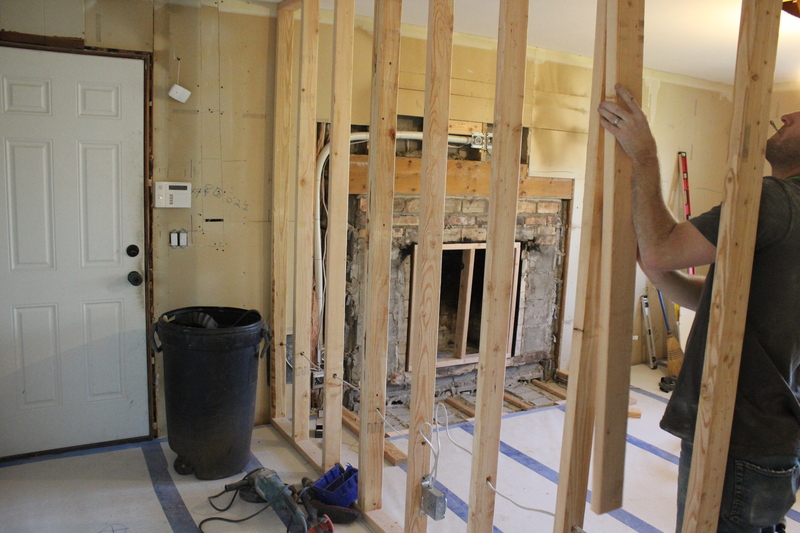 We put two 8 cubby units and one 4 cubby unit along the bottom, and then two 8 cubby units framing either side of the window. 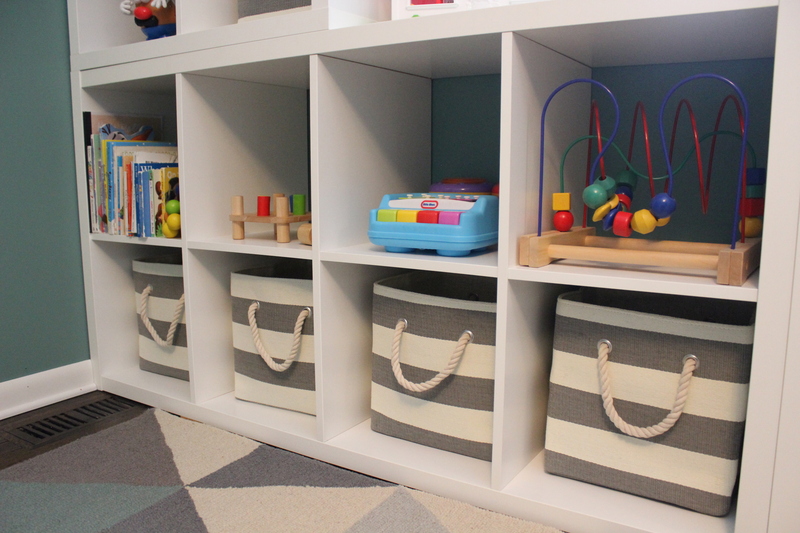 To conceal and organize a lot of the toys, I purchased these gray/white striped bins from Land of Nod. I have things like legos, playdoh, stickers and coloring books in them. Honestly, a few up top are empty so we have room to grow into them. 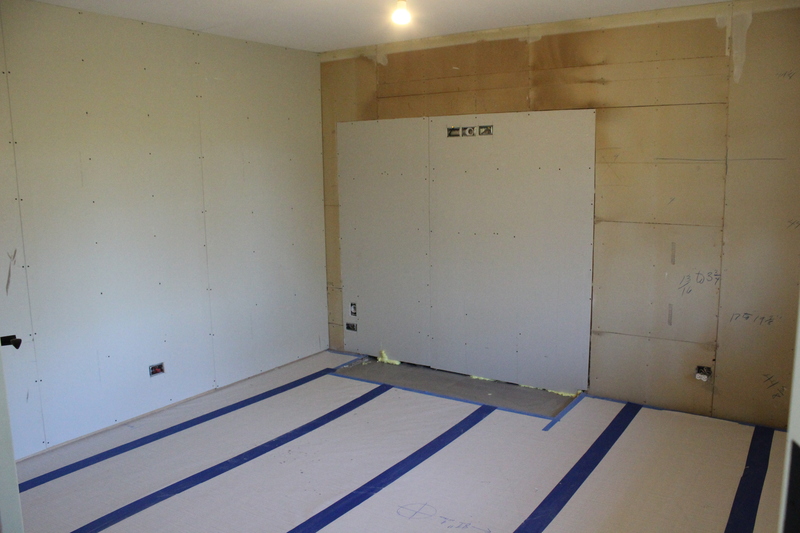 Here’s a look at the room from our foyer. 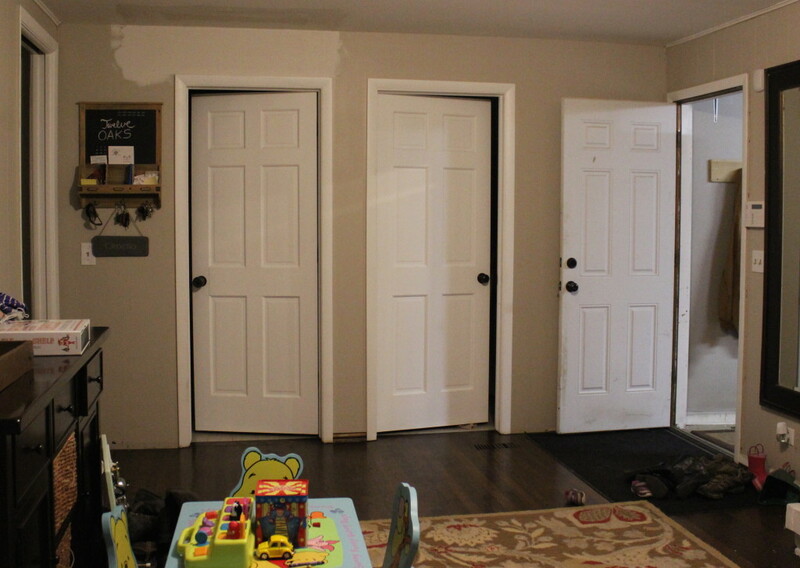 We installed the french doors a couple of years ago after we removed a hall closet that used to be here. 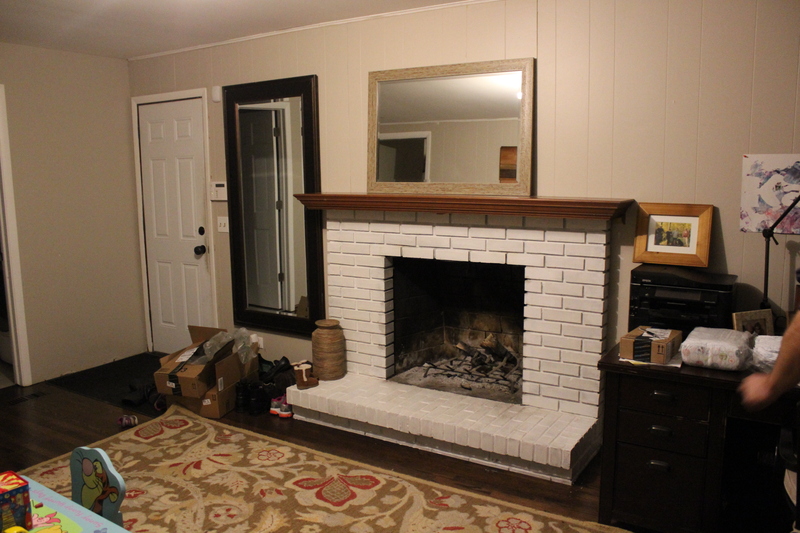 Finally, here a couple before and after shots. 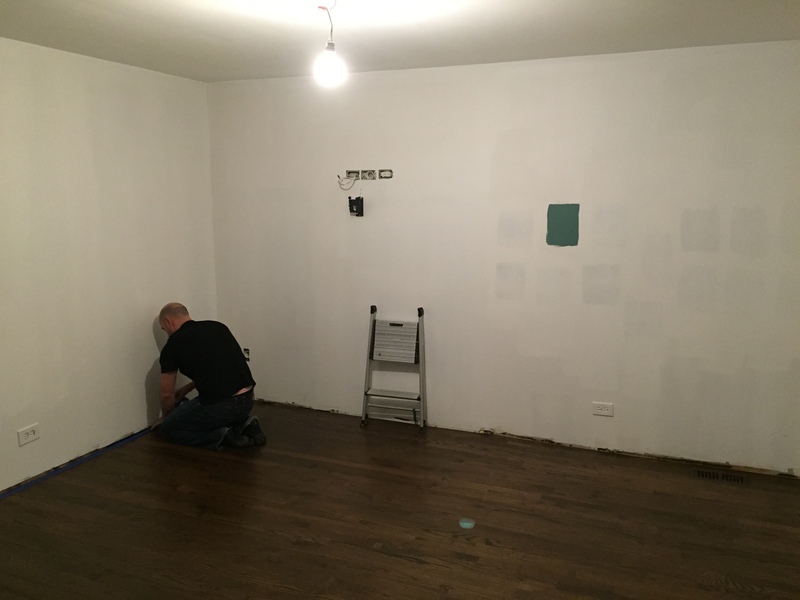 This space is unrecognizable! I can’t tell you how nice it is to get all of Kate’s toys out of the living room and rest of the house. 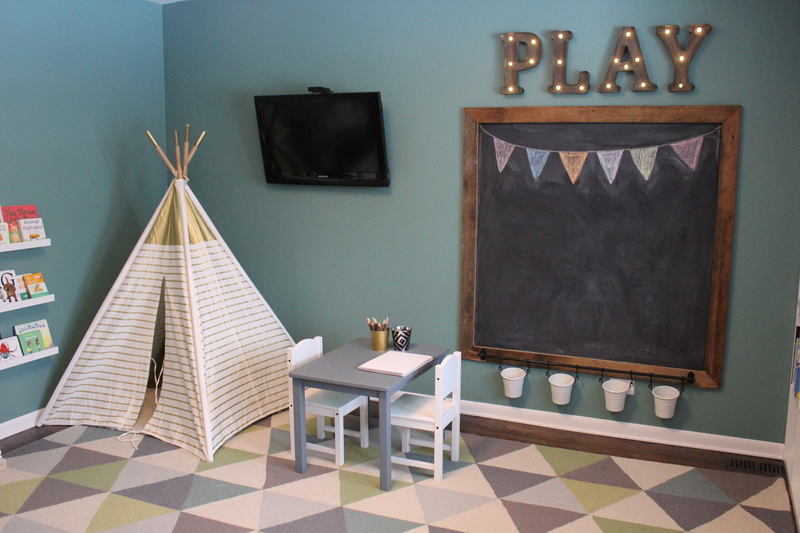 We’re really enjoying have a dedicated playroom and spend so.much.time in here. Heck, Ben and I find ourselves hanging out in here even when Kate isn’t home or sleeping. 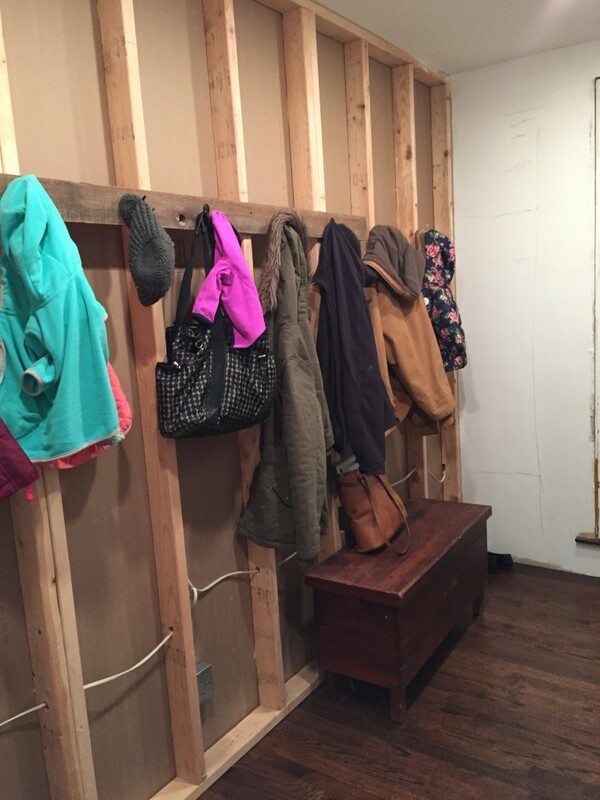 Plus, we figure the room can easily turn into a cozy hang out/movie space or office down the line. 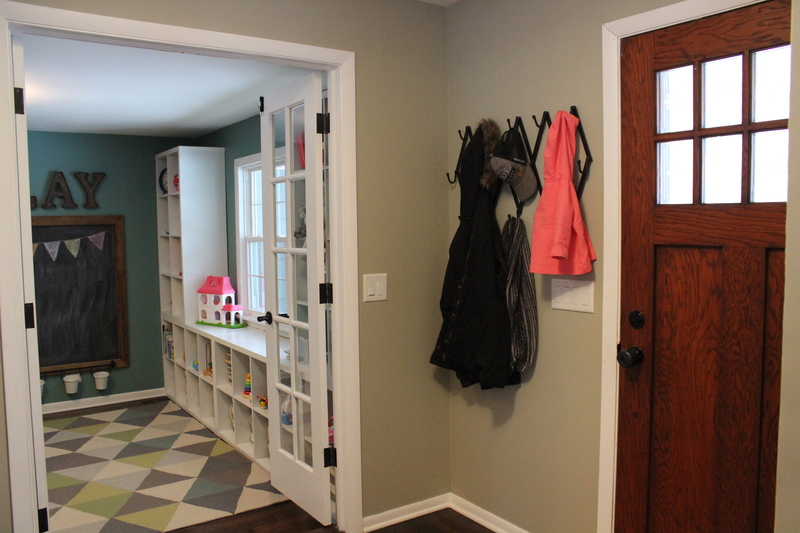 I hope to have an update on the mudroom in the next couple of weeks. It never ends…. It’s that wonderful, albeit stressful, time of year again. Time to find gifts for our loved ones, ones that they will hopefully use and enjoy. 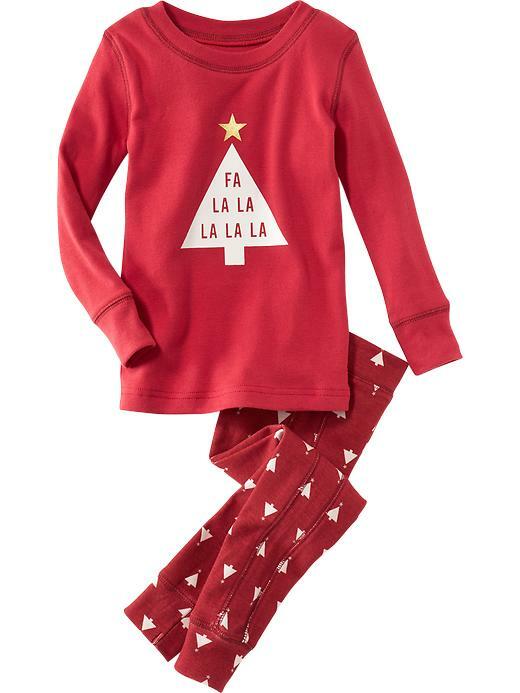 I’ve been gathering gift ideas for our 21 month old daughter, Kate, so I thought I would share them to help anyone who needs ideas for 1.5-2 year olds. Rody Horse. Kate gravitates to this bouncy horse toy everytime she see it at someone’s house. We’ve bought this as gifts for some other friends and family members and it is always a hit. It comes in a bunch of colors but I like the teal one best. 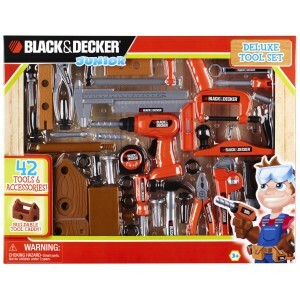 Play Tool Set. 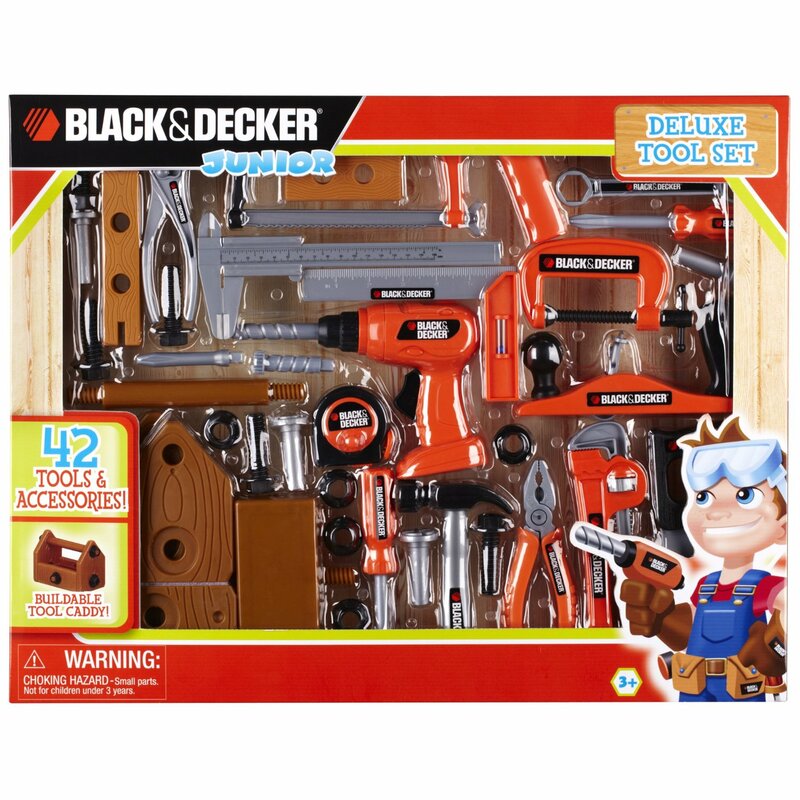 Kate is always interested in all of the various projects we have going on around the house and wants to help, so I think a tool set like this Black & Decker one would be perfect. Girls can be handy too. Learning Tower. Cooking while trying to entertain a toddler can be a challenge so we’d love to get Kate a learning tower so she can be a part of the action. Amazon sells this one, which I heard will be $50 off for Black Friday. Though I think we will probably build our own using Ana White’s plan. There’s also a popular Ikea hack using an Ikea step stool, which looks so simple but it doesn’t fold flat like the Ana White one does. Bilibo. 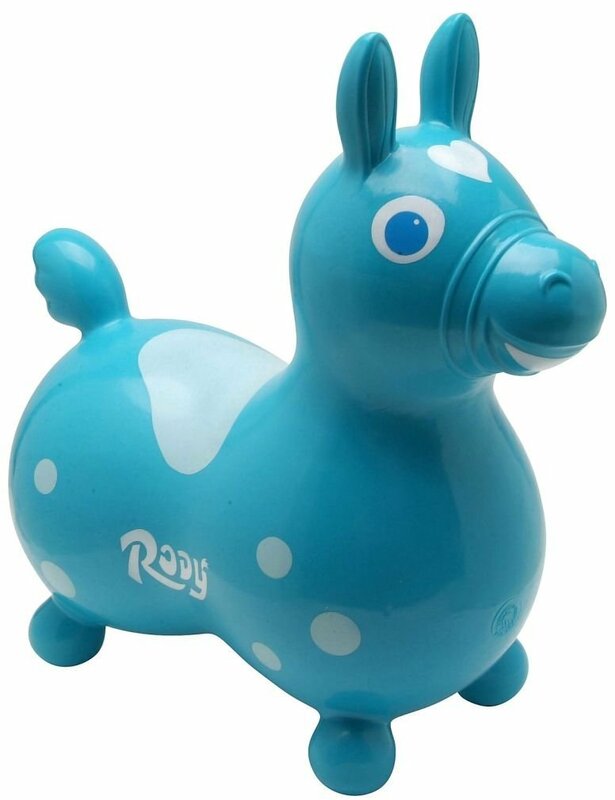 This thing is one of the most talked about toys on the internet. 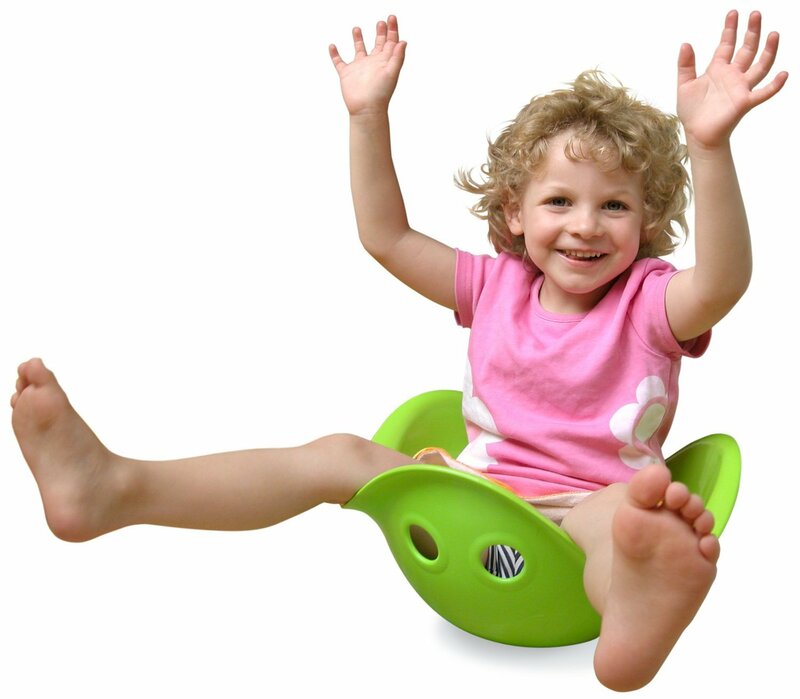 Kids can use it to rock in, spin in, hide under, sit on, tote with, and peek through. I think this could entertain Kate for years to come. 3-in-1 scooter. Kate loves ride-on toys and bikes. At daycare they say she is a bit of a daredevil on the bikes, lol. 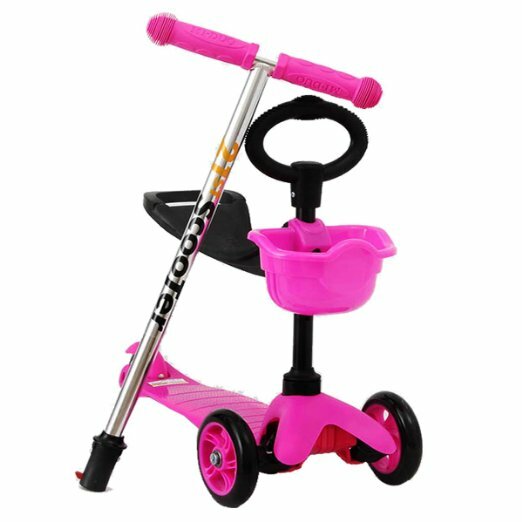 I think she would love this scooter toy that adjusts as they get older. Bath toy spout. This bath toy looks like a lot of fun and Kate hasn’t gotten any new bath toys since she was a baby so I think it is time to spice things up. 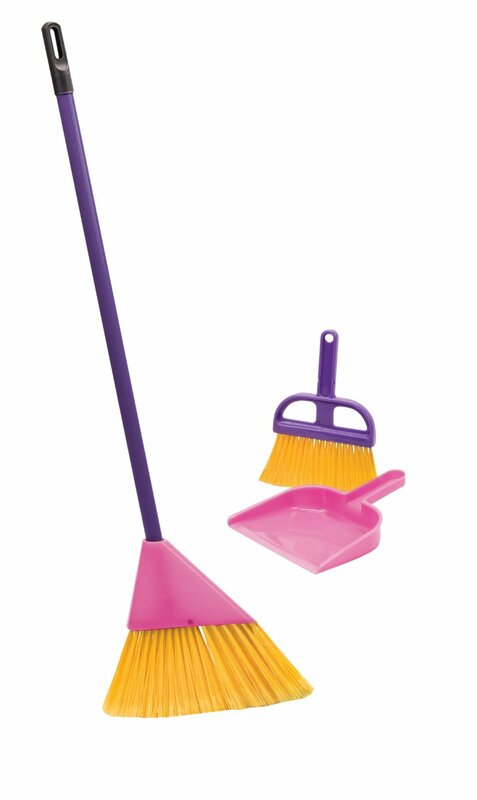 Toy Broom & Dustpan. Kate loves to try and help us clean and will try and push a gigantic shop broom. This inexpensive toy broom set should be a hit. 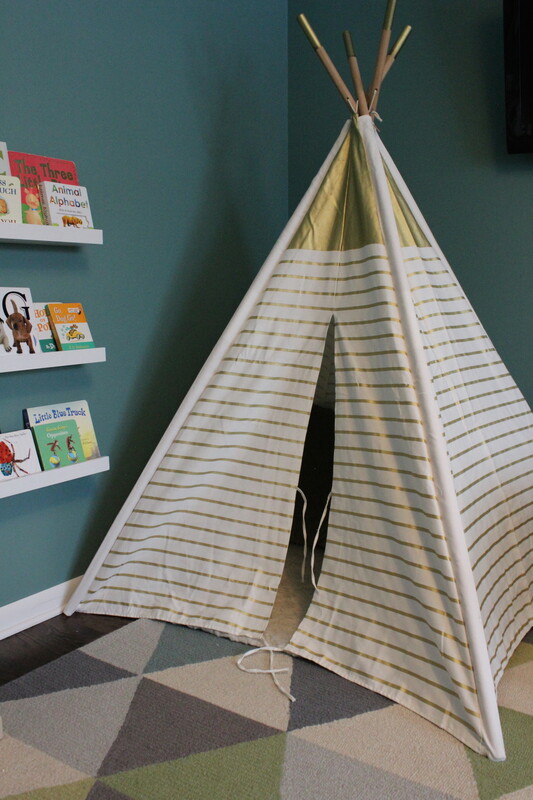 Play teepee. 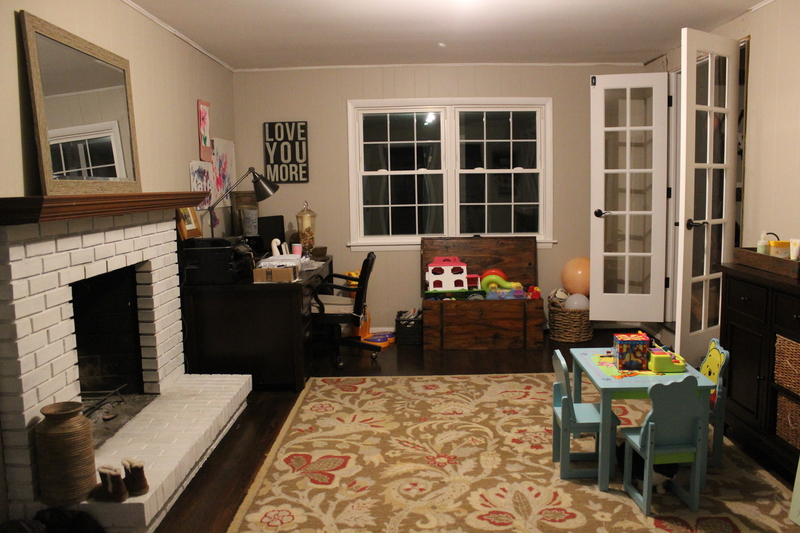 Our big project for the winter is to convert our den into a play room for Kate. 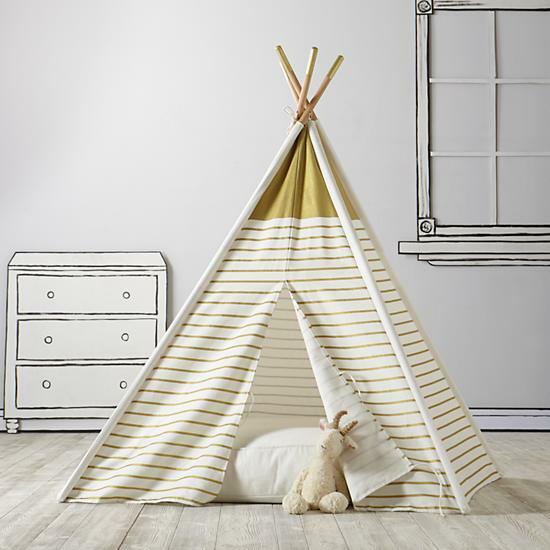 I think this teepee from Land of Nod would work perfectly in there to give her a little private escape to read and what not. Chrismas PJs and a book. I started a tradition last year where she gets Christmas PJs and a Christmas story on Christmas Eve to wear and read the night before Christmas. Then she has cute PJs on the next morning when she opens her presents and I take a million photos. These Christmas PJs from Old Navy are cute and festive, and for a book I’m thinking The Polar Express. Last year it was How the Grinch Stole Christmas. 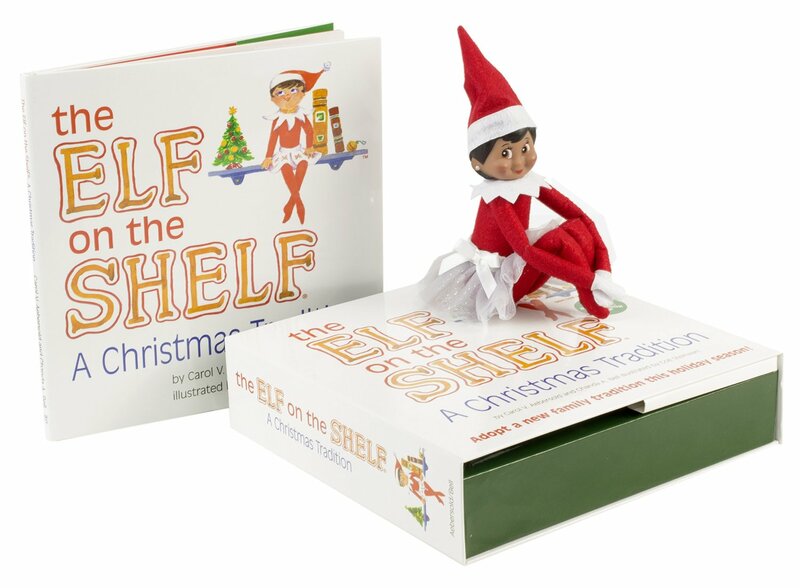 Elf of the Shelf. Not so much a gift, but we just purchased an Elf of the Shelf to do with Kate this year. I’m looking forward to having fun putting the elf in funny places each night after she goes to bed. Pinterest has some hilarious ideas. I also didn’t realize the elf came in different genders and eye colors so of course we got the brown eyed girl one. Lastly, if you are like me and do 90% of your shopping online, you should definitely sign up for Ebates if you haven’t already. It’s a site that gives you a percentage back on every online purchase you make. Almost every major retailer is on there. And you don’t have to remember to shop through Ebates if you install the plug in so it pops up every time you visit a retailer that offers an Ebates reward. I signed up a couple months ago and already have earned over $50 in cash back. They send you a check every quarter. So simple. We celebrated Kate’s 1st birthday with a “Cute as a Button” themed party over the weekend. It turned out even better than I had hoped! Here’s a look at the decorations. 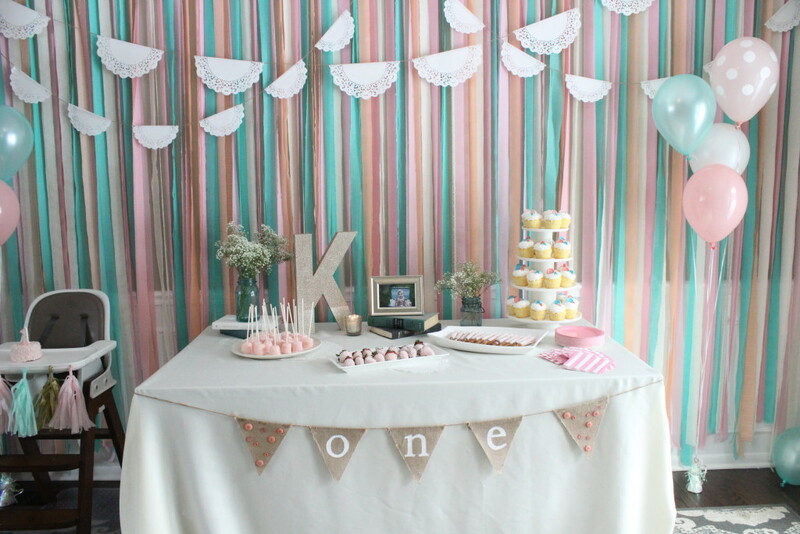 The main feature was the streamer backdrop. 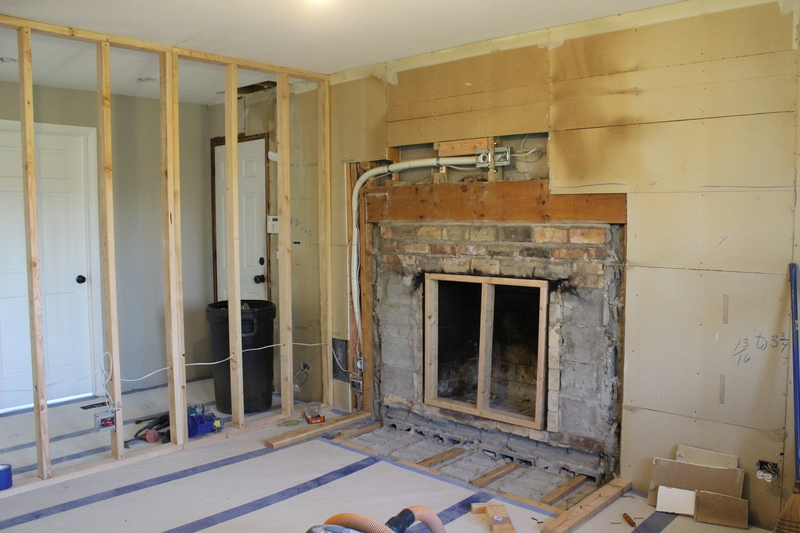 At 15+ feet wide, it was a labor of love. 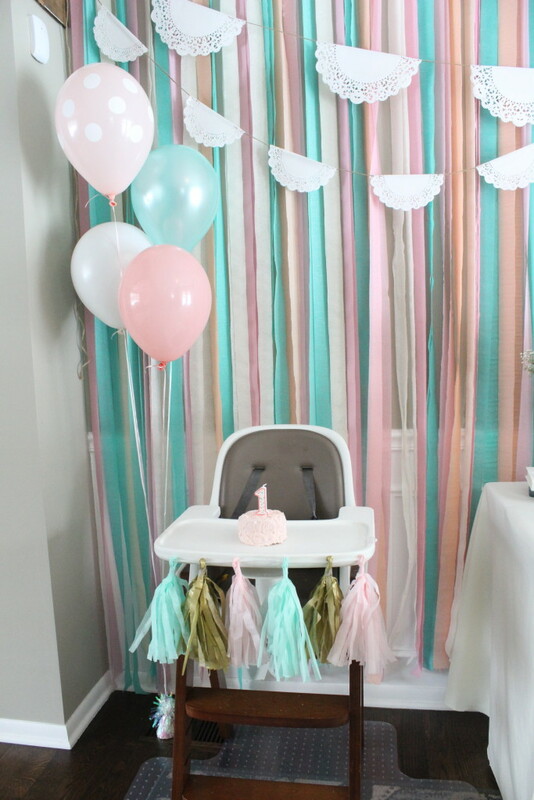 To make it, I followed this tutorial and used about 16 rolls of streamers in peach, pink, ivory and seafoam green from PartyPro.com. 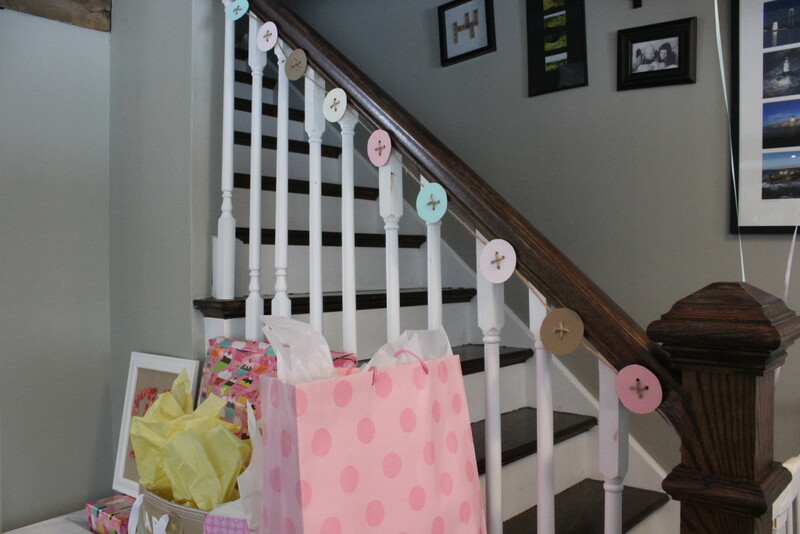 The doily garland that drapes in front of the streamers is made from two different sized paper doilies that are folded over and glued onto twine. 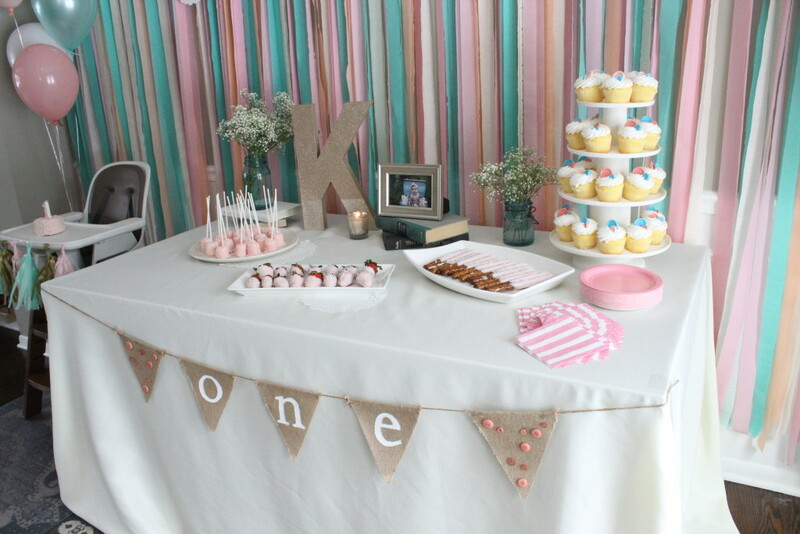 Hanging on the front of the table is a burlap bunting which we painted “one” on and added pink buttons on the side pieces. On the “sweets” table was two bunches of baby’s breath in light blue mason jars, a cardboard “K” decorated with glittery paper, a framed picture of Kate, some books, a candle, homemade pink chocolate-dipped marshmallows, strawberries and pretzels, plates, napkins (from Target), and grocery store bought cupcakes decorated with homemade candy buttons. The candy buttons I made using Wilton’s Candy Melt and this button candy mold. 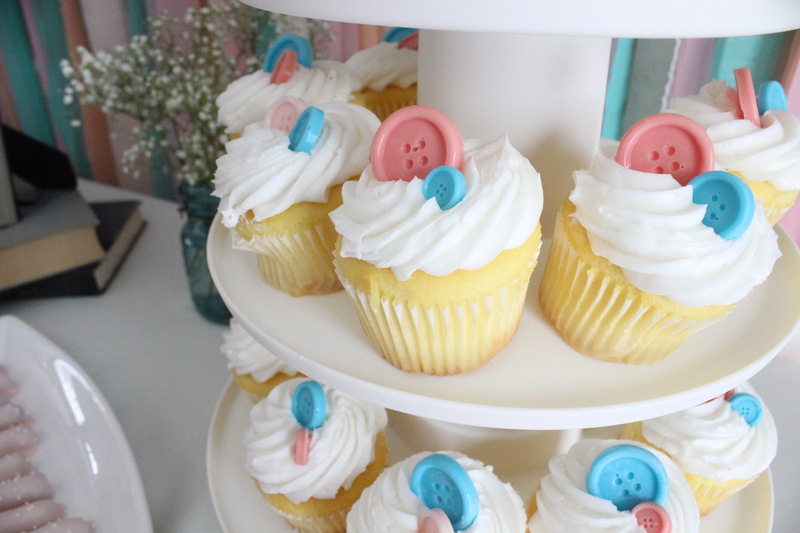 Everyone asked if they were real buttons. I made a tissue paper tassel garland for her high chair using this tutorial. 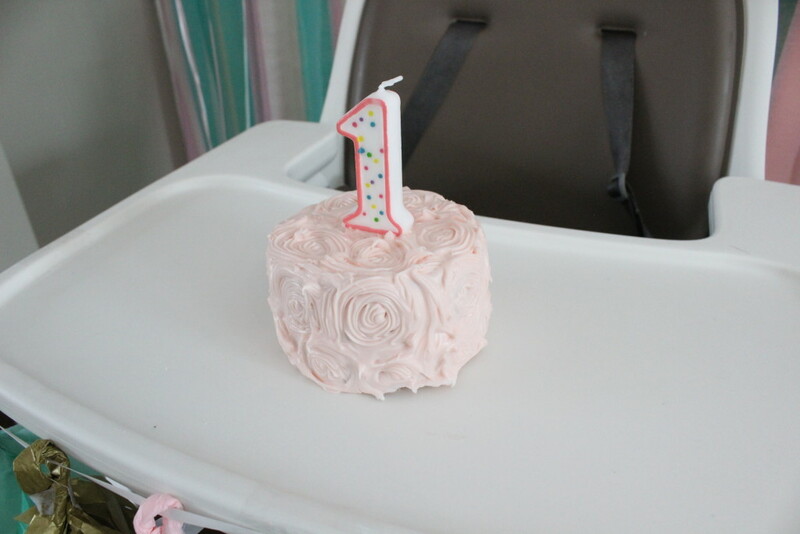 Her smash cake I made using this tutorial. The rose decoration was surprisingly easy, you just make circles! I made this button garland by cutting out circles from scrapbook paper and punching out four holes in the middle. Then I strung twine through each of the holes and together. 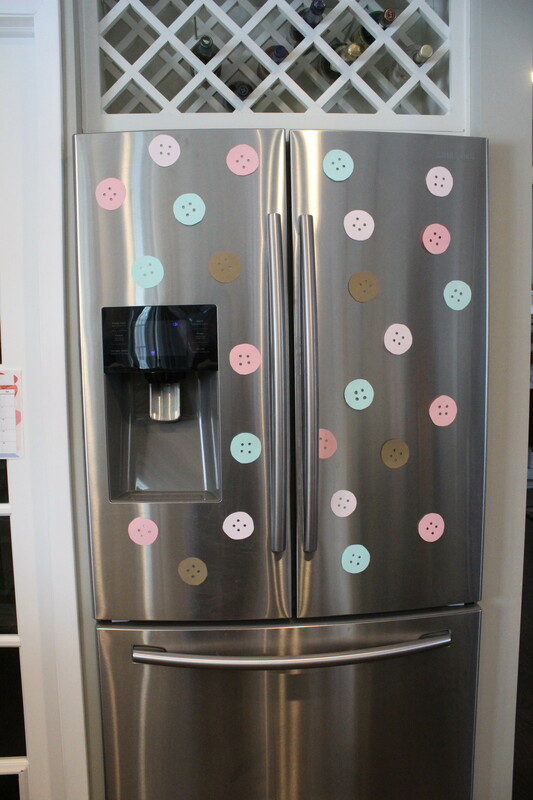 We made far too many paper buttons, so I stuck them to the fridge, too. 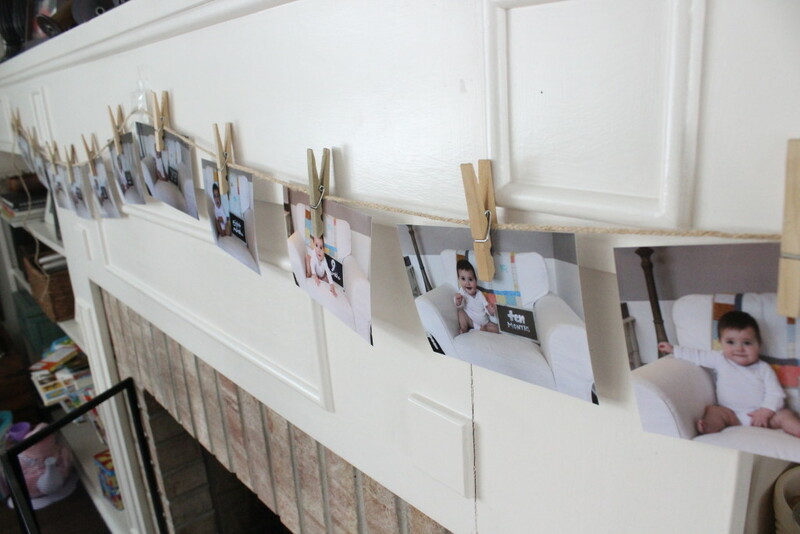 I also strung up her monthly photos above the fireplace using twine and clothespins. For Kate’s special birthday outfit I purchased this gold glitter “one” onesie and this peachy-pink tutu and headband, all from Etsy. She looked so adorable. You can see the busy board that we made for her in that photo. 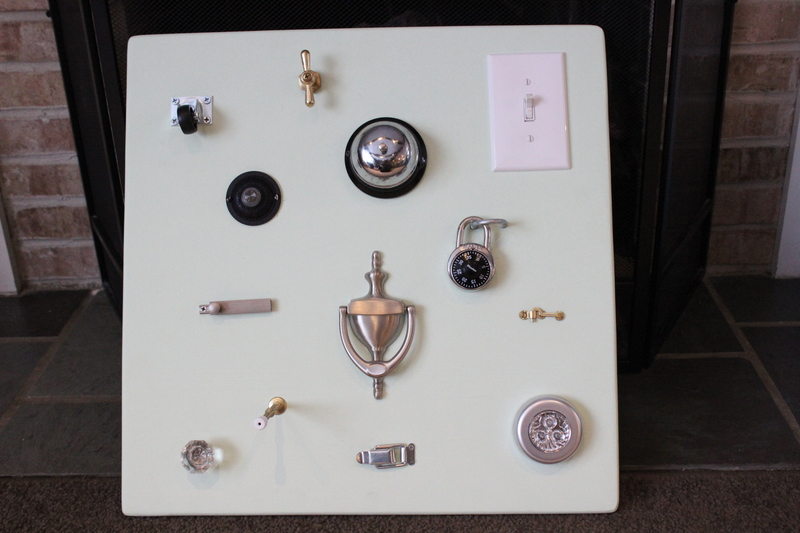 It has all kinds of fun trinkets on it including a desk bell, a light switch, a door knocker, an LED tap light, a door stop, a door bell, a few different types of locks, and a couple other misc items. So far, the bell is the big draw. I also made her a personalized board book with photos of her family members like this one. Here’s a closer look at the busy board. 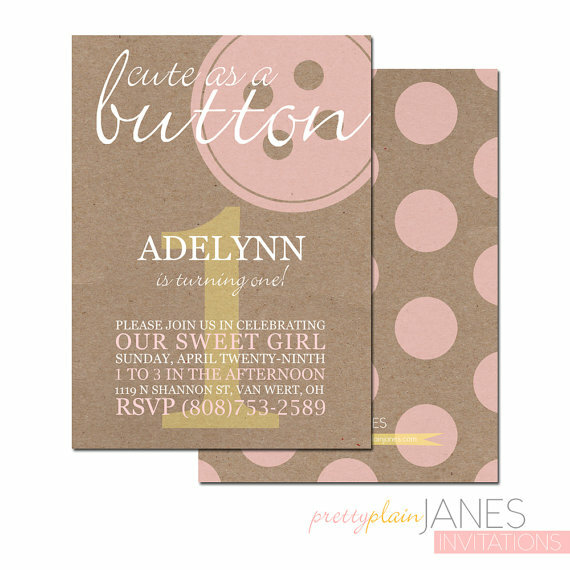 And lastly, here are the “Cute as a button” invitations that I ordered from Etsy. 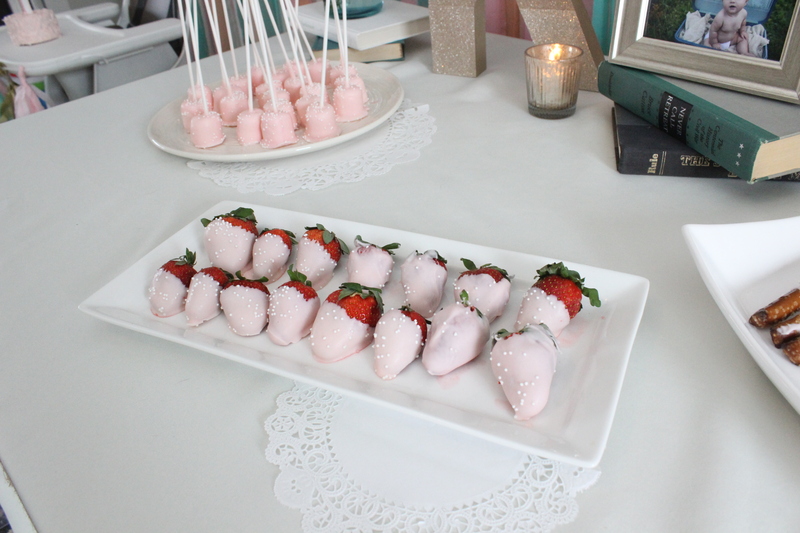 The party was a huge success and I am so sad it’s over. 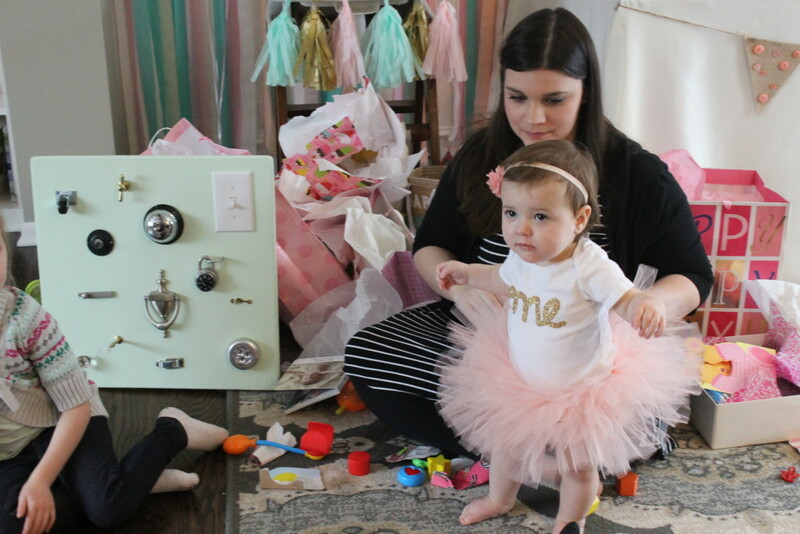 I loved planning and working on everything for my special girl. She’s not going to remember it, but I know I always will.